Technically I still belong to Bookmooch, and for a while I did a bit of Bookcrossing, but really the most effective way for books to find new readers is a bookswap. A physical shelf or set of shelves where patrons or passers-by can both take and leave books. The difficulty is deciding what to let go to the swap. However loose my sense of ownership – and it is loose, perhaps because most of my books originally belonged to someone else and will again, or perhaps because I agree with the concept that everything you own is another thing to be cleaned and housed and managed and it’s got to the point where I’m putting over half my plates and cups and cutlery in a separate cupboard just to keep the washing up to manageable levels – culling and making a decision to dispose of books is difficult. Books span that gap between physical object and experience. Unread books are books I might read one day, read books are books I remember enjoying. But I now have a more painless system for the books I’ve read at least. At the heart of said system is a paper LRB (London Review of Books) carrier bag. When I finish a book I either make a decision to keep it and put it (back) on the shelf, or I put it straight in the bag. Once the bag is full (LRB do a nice sturdy carrier) I take it to the bookswap at Wimbledon station. It’s a reasonably flexible system, and if I change my mind about one or more of the books while I decant them that’s fine. The idea is simply to break the default of putting books I may never read again back on the shelf when I’ve already got so many not-even-read-once books on there, and access to several very good lending libraries and lots of smaller ones. My home borough of Merton for example, which has 7 libraries, is also in a shared-service arrangement with Kingston, Luton, Tower Hamlets, Redbridge, Bexley.. – in fact 17 other boroughs in total. While Kensington (which I belong to because I work in the borough) is cosied up with Hammersmith and Westminster, which sandwich it between them (a map of the London Boroughs shows how exactly like a sandwich it is, all three with small footprints on the river, and then the lengths of them snugly running parallel, like countries which need access to an inland sea, although in fact it’s because the 1963 London Government act merged the smaller boroughs to the north and south of each other. Hence what I just incorrectly called Kensington is actually the Royal Borough of Kensington and Chelsea (RBKC), and what I just called Hammersmith is the London Borough of Hammersmith and Fulham (LBHF), but I’m wandering, and you can find it all on Wikipedia). What has made all this possible of course is electronic systems. The same thing which has allowed the amount of books I can borrow to balloon from 3 or 6 back in the 80s to 15 (RBKC) and 20 (Merton) here in the twenty-teens. First out of the bag is Antigone in the Diane J Rayor translation from the Cambridge University Press, which was bought in error for my MA when I was actually meant to buy the previous translation. Having read both I have to say I agree with whoever structured my course. The sentences in the latest version seem broken up in a way that strips out emotion instead of strengthening it, which surely misses the point of the play. Coriolanus, Shakespeare – this is another Cambridge University Press book bought for my MA. It’s actually a very good and useful edition, but I already have a huge volume of Shakespeare plays and sonnets and I’m unlikely to want to read the lengthy introduction or textual analysis again. Out it goes. Browse, The World in Bookshops, edited by Henry Hitchings. I thoroughly enjoyed this book and imagine any bibliophile would. Each chapter is a different writer telling us about their relationship with a bookshop, or bookshops; Ali Smith about the things found in the books that come into the charity bookshop where she volunteers, Ian Sansom about his time at Foyles, Elif Shafak talks about her childhood and the bookshops of Istanbul, Iain Sinclair about the closure of a shop that was a landmark – as indeed everything I’ve read by Sinclair seems to be about closure and change for the worse. And many other writers besides. I’m glad I found this book, but I couldn't be sure I'd ever read it again when there are so many other books to read, so under the new system it went straight in the bag. Let's see if I still feel the same when I come to empty the bag out. Music Night at the Apollo – Lilian Pizzichini. I never finished this book. It’s subtitled 'A Memoir of Drifting', and despite the interesting facts about boats and old factories and the sense of trying to find a present through finding a past I felt it drifted away too much, I also felt that even during her time spent with what papers call the underclass Pizzichini always knew she had a way out, which was not the case for the people she was writing about. It made me feel uncomfortable and vicarious reading it. Joy in the Morning – P G Wodehouse. I’ve got quite a lot of Wodehouse and there’s a lot in the libraries and frankly, this isn’t my favourite and I need shelf space. It’s going. Don Among the Dead Men. C E Vuillamy. This is a green penguin and less a ‘whodunnit’ than ‘whydunnit’ Doctor Kerris Bowles-Ottery invents a drug that causes euphoria and painless death. Recording his findings as any good scientist would we can see him slowly shift from theorising about the drugs use, to changing his ideas about when it might be used, to using it on people. It’s subtitled ‘a satirical thriller’ and although some of the humour is more wry smile than laugh out loud, it’s quite an amusing book. Something different. Metroland Julian Barnes. I wrote about this in my 1980 wrap up. The other joy of bookswaps is of course not knowing what you might find to take home. Sometimes it can be a bit lacklustre and samey (50 shades anyone?) and usually the Wimbledon station ones go so fast that the direction of books is generally out rather than in, which suits me. 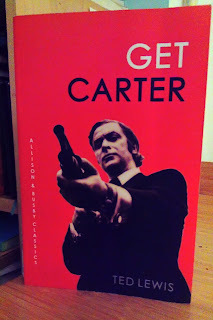 But the small bookswap at work has recently yielded Get Carter by Ted Lewis in a very nice paperback, and since that was apparently the start of the ‘noir school of British crime writing’ (which I think of more as ‘gritty’) and it wasn’t a book I’d have thought to look for otherwise, I’m more than pleased.